What Happens if the Parachute Fails To Open When Skydiving? The truth about skydiving is that it’s far less risky than you might think. From the military style in which skydivers are trained to the huge investment in both time and money that goes into creating the equipment, to the basic safety checks we all conduct prior to jumping, skydiving today is safer than it’s ever been. According to the National Safety Council, a person is more likely to be killed getting struck by lightning or stung by a bee than during a skydive. But we’re not here to talk about safety. We’re here to answer the question of what happens if the parachute doesn’t open on a skydive. And the reason that’s not a question of safety? ‘Malfunctions’, as it’s called when a parachute doesn’t open, are perfectly normal parts of the sport and something we can manage and rectify. Why would a parachute fail to open? There are lots of factors that can contribute to a parachute not opening. The successful deployment of a parachute is dependent on the correct packing of that parachute and is affected by any changes to that process or to the body position of the skydiver when they go to deploy. That’s why all skydivers are fully trained in the correct parachute packing procedures and the body position to adopt to aid the successful deployment. But with all precautions taken and all training employed, it’s still possible for the parachute not to open successfully, be in through error or simple chance. Typically, one in a thousand parachutes will fail to open. What is the skydive safety procedure when the parachute doesn’t open? An essential part of the training undertaken by skydivers is learning how to manage a ‘malfunction’ and how to rectify the situation. Skydiving ‘rigs’ (the ‘backpack’ we wear containing the parachute) are very clever in their design. They contain not one but two parachutes, one being the ‘main’ and one the ‘reserve’. The main parachute is connected using a ‘three-ring release system’; this system of three metal rings uses basic physics principles to spread the load of the weight of the person on the parachute in such a way that the pulling of one handle quickly and efficiently breaks the connection and allows the skydiver to ‘cut away’ the malfunctioning parachute. So when a skydiver finds themselves in a position where their main parachute isn’t opening or has opened with an error, they simply remove that parachute and deploy their reserve parachute instead. The reserve parachute is typically slightly different in design to make it more reliable and less ‘sporty’ in the way it flies. It’s packed in a similar way to a main parachute but with some key differences that negate any potential issues to ensure the reserve parachute will always open correctly. When a skydiver needs to use the reserve parachute, they may be choosing to do so and therefore activating the deployment themselves using handles located on the front of their equipment. If the skydiver is for any reason unable to deploy their own reserve parachute – for example if they have been knocked unconscious – an automatic activation device (AAD – most commonly a Cypres) will automatically deploy the reserve parachute for them. There are also support systems including the RSL (reserve static line) and MARD (main assisted reserve deployment) which aid the deployment of the reserve parachute and make it even faster and easier. You really don’t need to worry about your parachute failing to open. If you’re jumping as a tandem skydiver, your instructor has undertaken extensive training to ensure they are able to deal with any situation that might come about. If you’re learning to skydive alone or are a qualified skydiver, you’ll know that you’ve been trained to the highest level to deal with all potential eventualities. 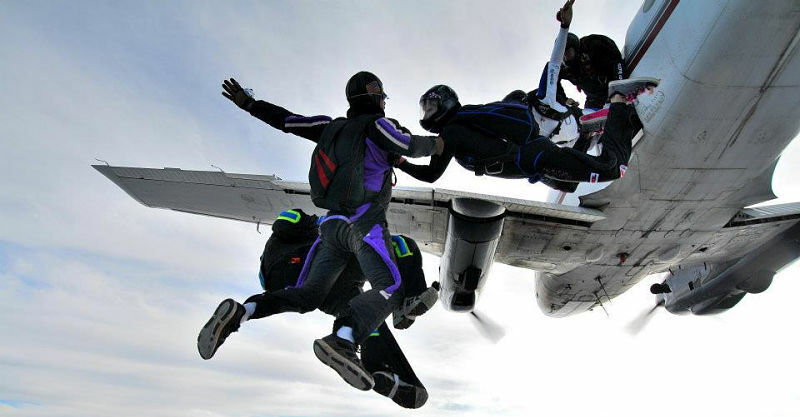 If you’d like to find out more on skydiving near Atlanta speak to one of our team members today!